Note: Rogers home phone is a perfectly good communications medium for use with an alarm. Should you wish an alternate method of communications to the monitoring station, see the page titled "Cellular Backup"
Please note, we install or "takeover" residential accounts only - no commercial accounts. Billing for the monitoring and service package is by Pre Authorized Payment Plan ONLY (void cheque, or credit card - monthly quarterly, semi annually or annually). We do not do any direct billing as one way of keeping our combined monitoring, service and warranty package rate of $14.95 at one of the lowest levels in the industry. With all the new home construction going on, I have been finding that the vast majority of new homes being constructed are virtually identical in their needs, and can be PROPERLY secured with the following package of both physical and electronic measures. Installing a professional alarm system (for make, models, and prices, see below) including all exterior doors armed, 2 pet resistant Paradox Digiguard 75 motion detectors, basement windows armed, monitored smoke detector. Provide a comprehensive monitoring package comprised of top quality ULC rated monitoring by Security 24 Monitoring Network Ltd on Woodward Avenue, for a rate of $14.95 plus HST ($16.69 - billing by automatic bank withdrawal or credit card ONLY, monthly term contractual commitment ONLY. Note: This price applies regardless of how many points of coverage are being monitored. For the above package to be provided, the basement ceiling must be accessible (open or removable tiles - no drywall), plus the sum total weight of all pets in the home must not exceed 80 lbs. 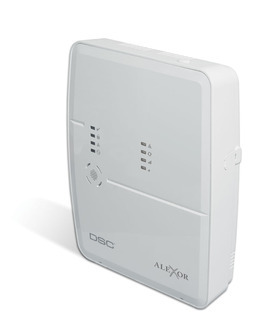 If your basement ceiling is covered with drywall, a totally wireless system (or better, a mixed hardwired system with wireless components to only those inaccessible points) can be provided at extra cost ("hybrid" DSC 1616, DSC Power 1832 or Spectra, plus add on wireless). For small homes, limited to 6 zones maximum. For expansion to 14 zones, add $65 for expansion unit. This series of panel models equipped with the high end MG LCD 32 English language readout LCD keypad, is the "standard" high end panel we install. If wireless capabilities are required , we will have to add the wireless receiver for an additional $75. Wireless key fobs are $40 each (1 way) or $60 each (2 way) with the SP series. Wireless motions are $100 each and wireless door or window contacts are $75 each. *Very important to remember, the TRUE cost of your system is the total of the five year price for installation and the monitoring package, plus on average one service call over that period of time. When comparing quotes, make sure you compare the make and model of equipment being installed. Paradox will cost you a bit more due to the higher end keypad, but you get what you pay for in this business as in all others. 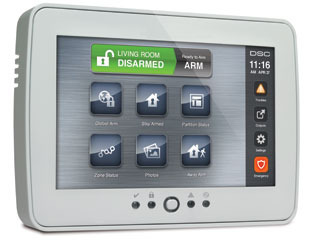 LCD keypads cost more but make your system much easier to use. Use 60 months for your calculations to get a more true representative price comparison and don't be fooled by artificially low upfront prices. It is very difficult, if not impossible in many cases, to install a second keypad on the second floor of a home if the wiring is not already in place. Neither the pre-wire or non pre-wire prices include installing another keypad on the second floor, or a smoke detector on the second floor, unless the wire is already in place at the location where the device is to go. Ground floor windows not pre-wired can ONLY be done using wireless components due to the extreme danger of tearing the internal wall vapour barrier. Where second floor installation is deemed a necessity, all panels can be equipped with an add on wireless receiver ($100) and wireless key fobs ($25 or $60 each), and a wireless smoke detector ($150). 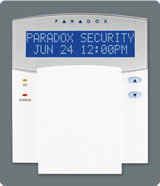 Paradox or DSC wireless window contacts ($75 each) and wireless motions are $100. For the pre-wire price to apply, wires MUST be in place at each point on the ground and second floor. We do not do attic work of any kind (even with the presence of a pipe from basement to ceiling). Otherwise, all ground floor and upstairs points of protection must be using wireless components. My specialty for years has been basement window security bars (openable with keys) which I can install at true dealer cost from $70 and up, each, depending upon window size (not included in package pricing ). Applicable dealer cost pricing available ONLY to my alarm customers. However, there are cheaper but adequate bars available now from such sources as Rona Hardware, and Canadian Tire that make it easy and less expensive to add these. Important Note: If I am installing your alarm system, I will be pleased to hook up your internal phone lines while doing your alarm. This can save you the current rate of $90 to have Bell do this while activating your phone line! I am a sole proprietor, in business since 1983, 20 years part time specializing in physical home security, and 18 years full time since I took a "golden handshake" from Bell Canada in 1994. I and my son install all our systems to ensure the best of installation techniques are used. I anticipate many more enjoyable years in this business, and promise you I will NEVER sell out my accounts to a money hungry "mass marketer" . That would be letting you down as my customer. At the moment, my son has been working full time with me for 10 years, and training to eventually take over the business, allowing me more time to run other aspects of the business which are somewhat less strenuous physically. Besides keeping the business in the family, this will provide long term price stability for my customers. Contact Information: Robert Campbell, 2316 Nerta Street, Ottawa, Ontario, K1G1E5 Tel: (613) 737-5955, Cell: (613) 798-3434, Fax: (613) 737-6093....email "rh.campbell@homemetal.com"...or..."robercampbell@gmail.com"....or skype "tourman40". David Campbell: cellphone (613) 227-1320 or email at "david.robert.campbell@gmail.com"